PORTLAND, Ore. -- Portland is an environmentally-friendly city, a scenic city, with Mt. Hood rising postcard-pretty in the distance and an architecturally graceful series of bridges spanning the river that flows through its heart, the Willamette. But there's a problem with the Willamette: It's toxic. Lurking in the river's sediment is a nasty cocktail of high level DDT and other pesticides, polycyclic aromatic hydrocarbons (PAHs), polychlorinated biphenyls (PCBs), heavy metals, tar deposits, solvents, and petroleum by products left by decades of manufacturing processes -- all of which pose risks to human health and the area's natural resources. The Willamette's final 12 miles, which stream into the Columbia River 100 miles above its mouth at the Pacific Ocean, are denoted the Portland Harbor, which was designated a Superfund site in 2000. And from that time forward the federally recognized sovereign Yakama Nation, with a 1.3 million acre reservation in eastern Washington State, 11 million acres of ceded territory, a vast area of usual and accustomed places, and one of the four Columbia River treaty fishing tribes has continually engaged in the process to make sure that neither the Willamette nor the Columbia rivers are short-changed "in any way, shape, or form," says Yakama Nation public information officer Rose Longoria. More than a decade ago Yakama tribal leaders traveled to Washington D.C. to advocate for both rivers' cleanup. "Everything that is in the lower Willamette and sediment flows downhill into the Columbia, directly or through the Multnomah Channel," says Longoria. The Yakama Nation withdrew from the Portland Harbor Trustee Council in 2009 over concerns that remediation of damages to natural resources would not extend to the injury and damages to natural resources in the lower Columbia River. The Yakama Nation is concerned with two issues. One is the cleanup; the other is the damage to natural resources. The Yakama have taken a firm stand on both. "Even though the boundary for the Superfund might stop the impacts in the Willamette, the toxics do not stop at that boundary line," says Longoria. "We are still on the table with the federal, state, and tribal government team, but Yakama is on its own with the natural resource issue." Last week, the release of a feasibility study that offered a proposed range of clean-up options by the Potentially Responsible Parties -- the companies responsible for the contamination, referred to as the Lower Willamette Group -- was a major milestone in the lengthy Superfund process, Longoria said. 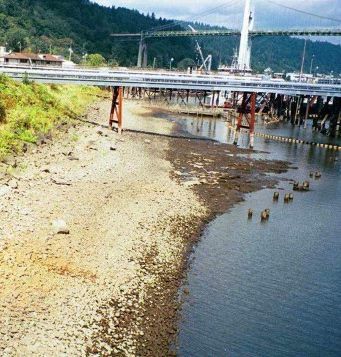 That has prompted the Yakama Nation to call for those responsible for the Superfund site to pay for its cleanup and all necessary remediation in both the lower Willamette and Columbia rivers. "It is a once in a lifetime opportunity to do the right thing regarding the Willamette River's clean up, critical to the health of the Columbia River," says Virgil Lewis, chairman of the Yakama Nation's Fish and Wildlife Committee and a Yakama Nation tribal council member. "Generations of my family have fished these rivers," Lewis said. "Now as an elected official and on behalf of the Yakama Nation, I ask for the restoration of the Willamette and Columbia not only because failure to do so violates the Yakama Nation's treaty, but also because failure violates the civil rights of all people who rely upon these rivers for subsistence fishing and other uses. "The Yakama Nation cannot turn its back on the harm Portland Harbor pollution has done -- and continues to do -- in the Columbia River," Lewis added. "There is nothing more important than honoring our ancestors by protecting the spiritual and cultural resource that has sustained our people for thousands of years, and restoring it for all people that will use this magnificent resource for generations to come. We must clean these rivers fully and completely."